A crispy bottom crust covered with a sweet gooey caramel-like layer, which is topped with a layer of chocolate. 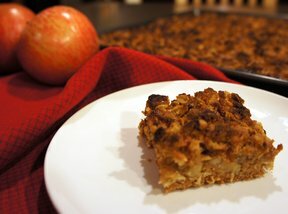 These bars are just the right combination of crispy and chewy textures. Melt marshmallows and margarine together and add Rice Krispies. Press into the bottom of a buttered 9 x 13 pan. In a saucepan, bring the syrup and brown sugar to a boil. Remove from heat and add peanut butter. Pour over Rice Krispie mixture. Spread evenly. Sprinkle the chocolate chips over the caramel layer immediately. Allow the chips to set on the caramel layer for approximately 10 minutes and they will melt to where you can spread them over the top evenly. "Is there an exchange for Peanut Butter? I detest the stuff & it's in so many recipes! tks jmw"
"This bar recipe is a lot like a recipe I have for Scotcharoos, which my family loves but this recipe was even better! 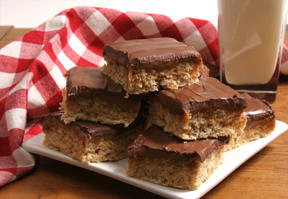 The caramel layer just makes these even more chewy and delicious than the Scotcharoos. I couldn't keep the kids out of them!"